This entry was posted in Food, Travel and tagged chocolate, Croque-monsieur, escargot, Food, Paris on August 2, 2014 by The Rowdy Chowgirl. I woke up this morning to an irregular tapping and scratching on the roof. I ran through my list of the usual suspects: Rain? Nope. Roof rats again? Ugh, I hope not! Racoons? Broken tree branch? Alien space ship? The sound continued, surprisingly loud. Curiosity finally spurred me out of bed and into shoes and coat. As I rounded the back corner of the house, I had my answer. It was a Steller’s Jay, hopping and pecking around industriously in the moss on the roof over my bedroom. Such a loud stomping ruckus for a bird! I have a flock of Steller’s Jays that live in my yard. I suspect they nest in the rhododendron hedges as well as the tall pine trees. They look like crows in blue jackets, and at least five or ten of them often strut and flit and chatter around the yard eating worms and doing whatever else birds do, very busily. I’m not a lover of birds exactly and I only know that my blue flock is Steller’s Jays courtesy of my friend Linda, who identified them for me a few years ago. But I enjoy their bright plumage and self-sufficiency. I wouldn’t have said that spring is here. It’s just as damnably grey and rainy as ever. But maybe the jays know something I don’t. Something has signaled the birds that today it is time to start picking at the roof moss and rootling in the rain gutters and they’ve been at it all day. And while I was out there, I noticed that a few crocuses are up. Crocuses aren’t so much a sign of spring as a reminder that eventually winter will be over. There are stages to this thing and we’ve reached the last one. The crocuses signal that we will need just a bit more endurance, but there is hope. This entry was posted in Environment and tagged crocuses, spring, steller's jay on March 7, 2014 by The Rowdy Chowgirl. Without question, the Bordeaux wine tasting session was my favorite experience at the International Food Bloggers Conference this year. Engaging speakers, fun tablemates, and free rein to pour our own “small pours” from the multiple bottles on our table–what’s not to like? I learned a lot about how to taste, evaluate, and describe wine. Oh, and the Bordeaux wines themselves? I could describe them as fruity, floral, earthy, woody, spicy, herbaceous…but I think I’ll settle for yummy. This entry was posted in Food and tagged IFBC 2013 on September 27, 2013 by The Rowdy Chowgirl. Lunch time at the International Food Blogger’s Conference in Seattle. We find a relatively quiet and zen-like corner of the room to eat and observe the crowd that flows like a school of…well, sharks actually, from table to table. There is excited clustering, there is a little good-natured pushing, there are marshmallows, there is a lot of tasting going on. The noise level and the temperature rise. Finally, enough food is consumed for now. Time for the wine tasting. This entry was posted in Food and tagged IFBC 2013 on September 21, 2013 by The Rowdy Chowgirl. 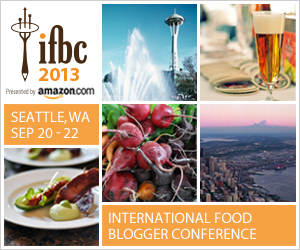 I’m at the International Food Blogger Conference (IFBC) today in downtown Seattle. The weekend is just getting started but already I’ve scarfed up a delicious lunch, listened to a keynote address by Dorie Greenspan–who was, of course, sweet and funny, rootled through a bag of goodies, met up with a friend , met some new fellow food bloggers, paged through a luscious cookbook that is soon to be released, and maxed out my poor introverted self. I’ll let you know what the rest of the weekend brings! This entry was posted in Food and tagged IFBC 2013 on September 20, 2013 by The Rowdy Chowgirl. Passionate about food! Growing, cooking, eating, thinking, and writing about food. A Book Club with Bite. Join the Delicious Debate. The Rowdy Chowgirl is licensed under a Creative Commons Attribution-NonCommercial-NoDerivs 3.0 Unported License.